Ayal Njanalla malayalam movie to be directed by Vineeth Kumar featuring Fahadh Faasil in lead will start rolling on 24th December 2014. Mrudula Murali and newface Divya Pillai will be the heroines. Scripted by director Ranjith, the movie will have Ranji Panicker, Joju, Mala Aravindan, Chemban Vinod, Sreekumar, T. G Ravi, Dinesh Nair Anil Kumar, Babu Annoor, Jins Bhaskar, Sreekanth Menon, Subheesh Jishad, Akshat Singh and Susheel Kumar in prominent roles. Actor Vineeth Kumar is all set to venture into filmmaking with a bunch of mainstream artists donning prominent roles. 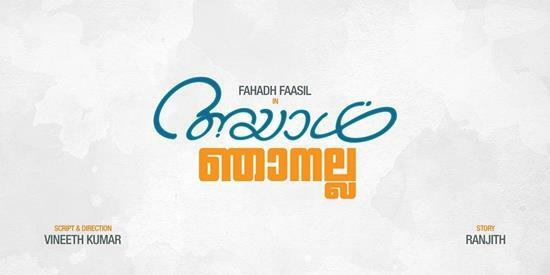 The movie titled 'Ayal Njanalla' touted to be a fun filled romantic entertainer boosts of having Fahadh Faasil in lead. Scripted by prominent screenwriter and director Ranjith, the movie will start rolling on 24th December 2014. Mrudula Murali and newface Divya Pillai will be the heroines in the movie. The story revolves around the lead character played by Fahadh who is settled in Gujarat for the last 15 years. He is one among many people who have migrated from Koyilandi to North India to do tyre business. The story will be packed with basic elements like humour and thrills which could keep the audience intact. Vineeth, who has already his hands at ad filmmaking, wishes to prove his skill as a director too. Ranji Panicker, Joju, Mala Aravindan, Chemban Vinod, Sreekumar, T. G Ravi, Dinesh Nair Anil Kumar, Babu Annoor, Jins Bhaskar, Sreekanth Menon, Subheesh Jishad, and Susheel Kumar will be seen in prominent roles. The little dancing sensation Akshat Singh who shot to fame through the reality show India Got Talent will also be a part of the movie. Ayal Njanalla is produced by Raghunath Balakrishnan and K. G Suresh under the banner of R S Media Vision. The camera will be helmed by Shamdat while Manu Rameshan handles the music department. With Gujarat and Bangalore as the shooting locations, the movie will reach theatres by March 2015. Meanwhile, Fahadh Faasil has stopped hearing fresh scripts due to his long line of committed projects. He has also signed a bunch of movies which include 'Vambathy', 'Maheshinte Prathikaaram', 'Maniyarayile Jinnu' 'Cartoon', 'Sivaganga Factory', untitled projects helmed by Siju S Bava and Ranjith. His upcoming releases include 'Haram' and 'Mariyam Mukku'. He plays an ad filmmaker, who hails from Kochi royal family in the entertainer helmed and scripted by debutant Siju S Bava. In Vinod Sukumaran's Haram, Fahadh essay the role of a divorcee and in Mariyam Mukku, a young fisherman.